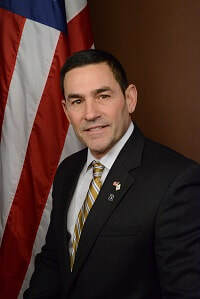 Robert Quattrocchi (R) represents District 41, which includes all of Scituate and a portion of Cranston. He was elected to the House of Representatives in November 2016. He serves as a member of the House Committee on Finance and the House Committee on Small Business. He was a partner in Quatro Brothers Concrete Finishing and is the former owner of Quatro Motorcycle Company. He is a 1981 graduate of Scituate High School. He is also a graduate of the American Motorcycle Institute in Daytona, Florida. Representative Quattrocchi is a member of the Scituate Lions Club, Toastmasters International and the Pine Tree Gun Club in Foster. A former Hope Elementary PTA member, former sponsor and coach of the Scituate Girls Youth Soccer, he is also a frequent volunteer and chaperone at his children’s school events. Representative Quattrocchi is also a lifelong motorcycle enthusiast. Born on December 11, 1963, he is married to Edwina and has two daughters.